Who doesn't love a little lace? I love lace. I've always have a passion for lace knitting. 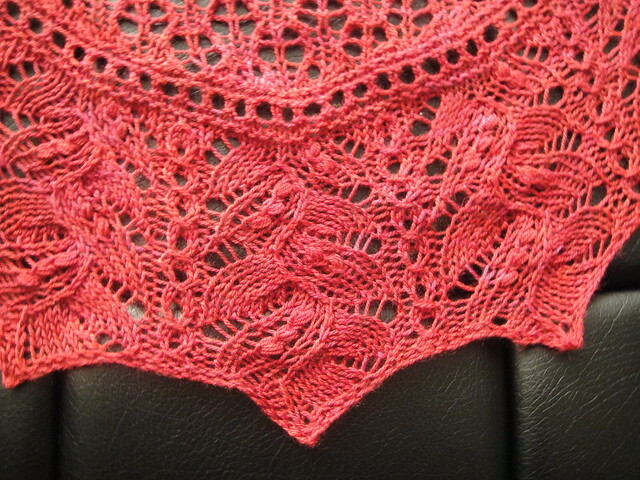 To me lace is the prettiest thing to knit. 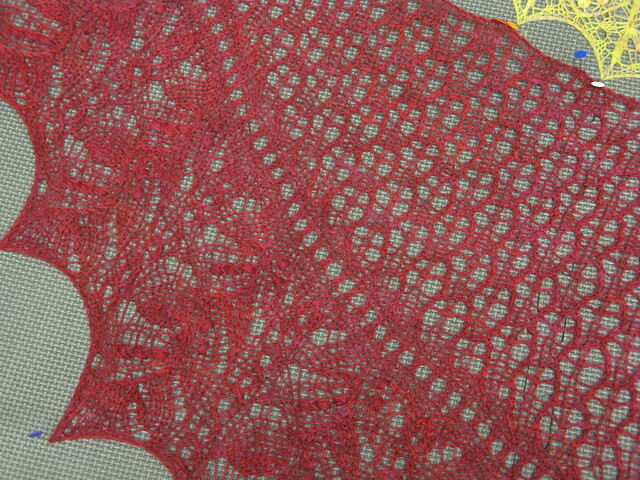 Whenever I get to choose a project, I always choose lace. Lace patterns are always challenging, it's never boring, you're always learning new techniques to make it perfect. With all the patterns out there and with the limited time, it's always hard to choose the perfect pattern. I made this shawl for a good friend even though she NEVER received this shawl. 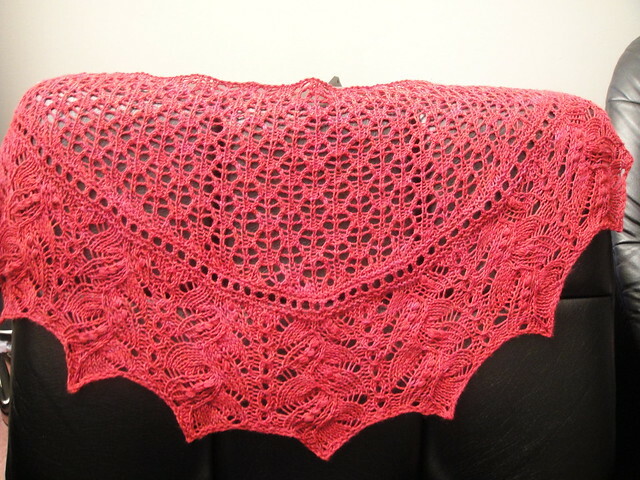 It was one of the two shawls that were lost in the mail.Canada Post wasn't able to track it down for me. All I knew was it NEVER left the country and NEVER arrived in Hong Kong. Don't ever let me find out who stole my parcel I'll be so pissed. When my friend knits lace, she always chooses mohair yarn for her projects and mohair yarn are mass produced so when I was making a shawl for her, I decided to use something different. Different fiber and I opt for hand dyed yarn which is an all time favourite of mine. Ever skein of hand dyed yarn are different which makes them unique so every shawl will be a little different. I received this yarn as part of my yarn club subscription from Tanis Fiber Arts. The colorway is Cranberry. It was a yarn club subscription yarn so I only had access to one skein and I used it on a project that my friend never received. From the indoor lighting in the living room you can't really tell the yarn is variegated, it looked like a boring red yarn, it was actually a semi-solid red yarn. You can only tell the reds apart in the blocking pictures. 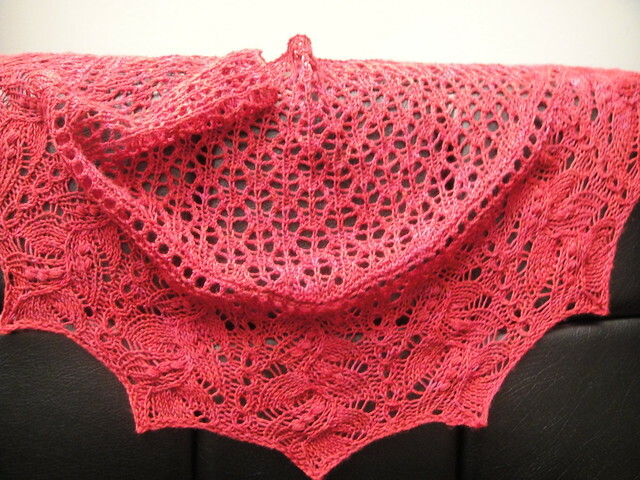 This is a crescent shape shawl and had open lace work throughout the main body while you use short rows shaping. This shawl is a little different from the ones I normally make. I normally start from the middle and work my way out to the edge, but for this shawl, I started from the edging and worked my way in. This was different from all my other projects. close up on the border of the shawl. the border is made up of vines and nupps. I'm not a big fan of nupps knitting, I often replace them with beads as I find them time consuming but I do find that nupps are great in this project. 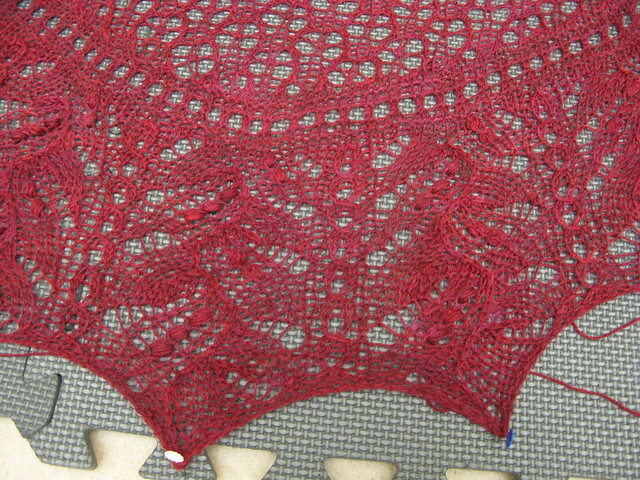 blocking of the lace border. There were a few sizes from the pattern, since I only had one skein of yarn, so I chose 15 pattern repeats. From the instruction I should have enough yarn to work 16 pattern repeats for the edge nupps and vines pattern, if I started with 16 repeats, I would never be able to finish it. I started with 15 pattern repeats and I barely had enough yarn to finish the project. I only had a few yards left.